The Sacrament of Confirmation completes the grace of Baptism by a special outpouring of the gifts of the Holy Spirit, which seal or “confirm” the baptized in union with Christ and equip them to share their gifts, live and give great witness to their faith as they build up the Kingdom of God. 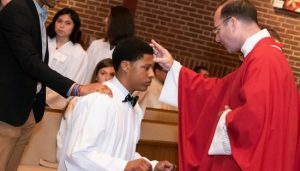 Preparation for the Sacrament of Confirmation takes place in the 9th grade, and the Sacrament is celebrated in the Fall of the 10th grade. Grades 1-8 of religious formation instruction must be completed before your teen is eligible for Confirmation. The entire Confirmation team is looking forward to an exciting year! Liz Reid is our Confirmation Coordinator. She can be reached at: 203-838-3788, ext. 107 or StMattRelEd@gmail.com. Click here for 2018-19 Confirmation Registration Forms. The forms were mailed out June 15, 2018. If you have not received one, please contact Liz Reid at ext. 107. Confirmation Retreat – An Amazing Day! To obtain a Confirmation Sponsor Certificate, the sponsor must be an active member of the Church, attend Mass regularly, and be an active participant in the Life of the Church. We are asking your family to attend Mass each week. We come together as a parish community to worship, thank God, and support each other in prayer. It is at Mass that we come to know Jesus in the Eucharist. 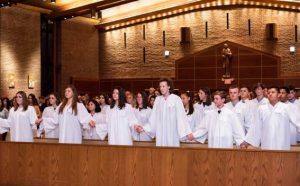 Attending Mass each week reinforces what is taught in the classroom. Without this important time to celebrate and pray together at Mass, it can be a struggle for your child … indeed, for all of us … to achieve a fuller understanding of the greatness of our God and the love and forgiveness of Jesus. Confirmation is a Sacrament that gives each of the candidates many privileges in the church. First, you will be considered a full member of the Church. You will be able to be Godparents to children at Baptism and you can be a Sponsor to candidates at Confirmation (at age 16). Along with the privileges come duties that you take upon yourself as a confirmed Catholic. One of the main duties is to follow Christ through following the Commandments. Your visible following of Christ can be seen in your participation of the Holy Mass every weekend and Holy Days of Obligation. You will also demonstrate your following Christ by your service. As a Parish it is our duty to see that you are given enough opportunities to worship and serve God. Classes will be held on approximately 13 Sundays, after the 5pm Mass until 7:30pm. Regular Mass attendance on weekends and Holy Days along with your family. Special Commitment Mass and Presentation Mass, 5pm. 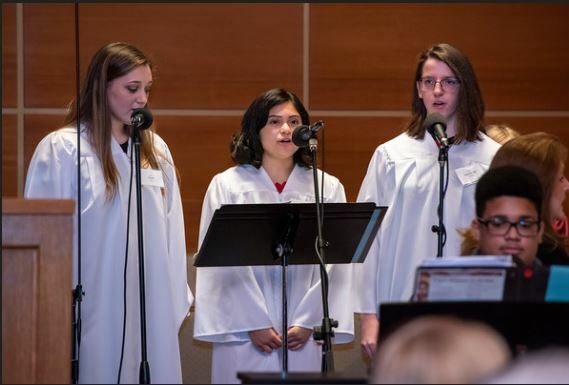 All candidates are to be trained as either Altar Servers, Ushers or Lectors, and serve such Ministry on a regular Mass schedule, or participate in Youth and or Contemporary Youth Choirs. Service Projects: Candidates for Confirmation should choose service projects (approx. 15 hours of service in the community or at events). More info will be at first class/parent meeting. 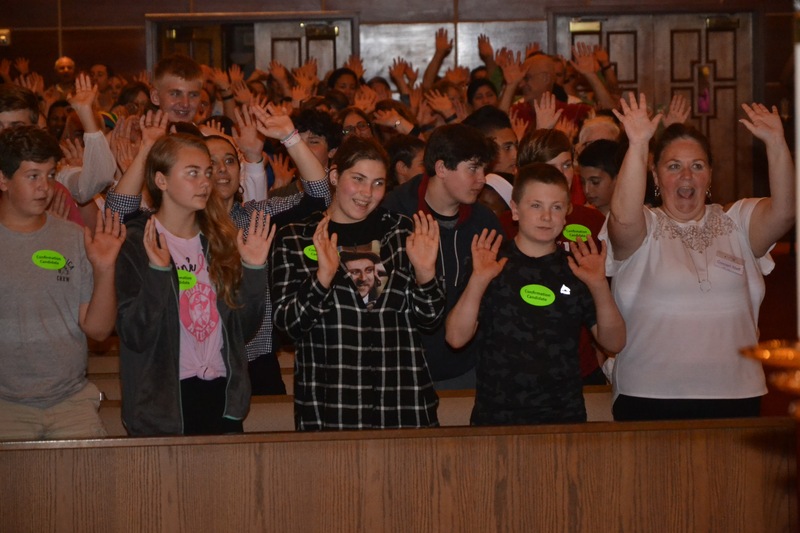 Bible Camp (completed summer ’19), Senior Bus, Youth Choir, classroom helper/babysitter for religious formation, Notre Dame Convalescent Home Pasta dinner help w/ setup & clean up (family opportunity), Church Cleaning (family opportunity), Community Dinners, Filling in the Blanks. Interview with a Clergy Member: Each Candidate will also have an interview with a member of the clergy sometime during the preparation program. All forms and assignments must be turned in before scheduling an appointment. Reconciliation Services: The Candidate along with their families is to attend a Family Reconciliation Service during Advent and Lent. 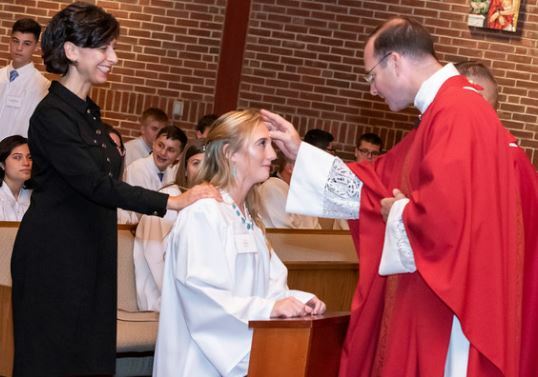 The Sacrament of Confirmation will be conferred by Bishop Frank J. Caggiano in the Fall of 2019. Confirmation Names: Candidates must prepare a one page essay on a Saint whose life they wish to emulate and whose name they will take at Confirmation. This must be a Saint recognized by the Catholic Church. Sponsor Certificates. The Sponsor obtains the Certificate from their parish. Family participation at Mass, regular reception of Eucharist and Reconciliation and Service Project. If you have any questions, or if you are interested in becoming a catechist, please contact us in the Faith Formation Office at (203) 838-3788, ext. 107 or by email at stmattreled@gmail.com. I am really excited to begin this confirmation journey with you. For those of you who don’t know me, I have been a parishioner for over forty years. In fact, I made my own Confirmation at St. Matthew (many, many moons ago now!). It has been my great joy to be a catechist for the past 10 years. I sit on the social concerns committee, coached the bible quest team, give children’s homilies, and Lector. One of the best things that I loved to do at church was to drive the bus for our elderly or home bound parishioners, taking them to and from Saturday mass. My faith has been the foundation for my life. It motivates, inspires, and comforts me beyond belief. 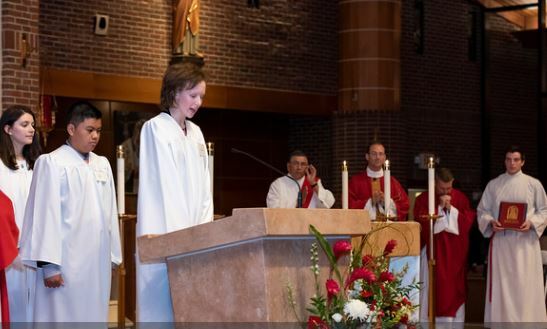 I am especially grateful to lead and be part of the Confirmation experience. It is especially exciting because I know many of the candidates and your families. It is exciting to share this journey with you all. I look forward to seeing many familiar faces, and I really look forward to getting to know the families that I haven’t met yet. I am happy to answer any questions that you may have about the Confirmation program. I consider Confirmation to be a journey for the whole family. 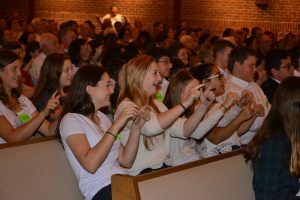 It is a journey made together to support, motivate and ignite the many gifts that your children already possess, and help them learn to share those gifts in their family, in the parish, and in the community, as they grow closer in their relationship to Jesus. I look forward to us all working together to help achieve that goal. I know that some parents have already offered to volunteer and I can’t thank you enough. Being a visible supporter of your child as they go through the Confirmation process is one of the most effective things we can do together. We welcome parent volunteers for hallway monitors, service project leaders and chaperones, and for other aspects and events of the Confirmation program. We especially welcome any parent who wishes to teach Confirmation. Please know I am available at any time for questions, cares or concerns. You can email me at the parish office or to my home email which is mer313@sbcglobal.net. In addition, please feel free to contact me on my cell phone (203) 722-9367. Again, I am very much looking forward to sharing this Confirmation journey with your child and you all. Many thanks, and all my best wishes for a great year!